its unique spectrographic absorbtion bands. where he had been born. than any metal including iron and nickel. Holmium lasers are used in medicine and dentistry. for jewelry, glass, and optical calibration. but turns bright pink in fluorescent light. to name yet undiscovered species. and noplacelikite would have the most. would never be found in the same rocks. 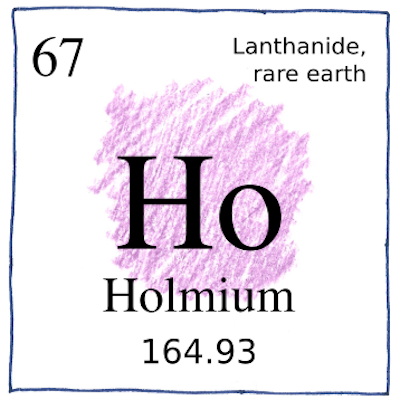 would fiercely compete for your holmium buyer. We are not finished describing diminishing fractions of rare earths, but at least there are only a finite number of them. Erbia (Jean Charles Galissard de Marignac’s oxide of erbium, which he had separated, along with yttria and terbia from Carl Gustav Mosander’s yttria) was eventually found to have contained erbium, thulium, holmium, dysprosium, scandium, ytterbium, and lutetium.